Having come across this brand around a year ago with their delicious desert bars (the banana bread muffin is literally to die for! 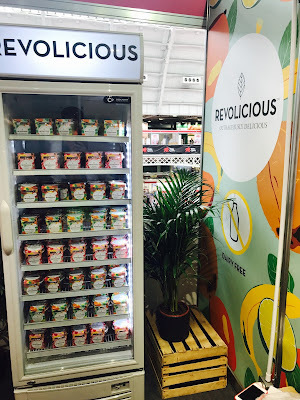 ), I was majorly excited to see them back with a brand new product line to add to their gluten and dairy free product range. Three different delicious options - Super Coconut, Sweet n Salty Almond and Hazelnut praline, not only are they rich in antioxidants, free from gluten and high in fibre, but they taste even better than their supermarket chocolate bar equivalent.... with 45% less sugar! 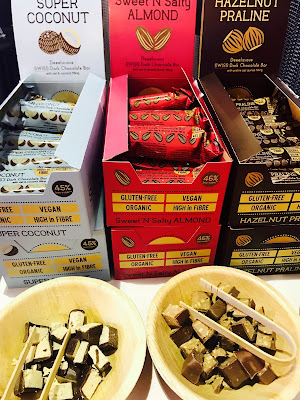 My favourite had to be the Bounty-like Super Coconut bar, high fibre oat and coconut shavings topped with a thick dark chocolate layer. With the combination of the oats and the whole, natural ingredients, it was far richer and wayyyyyy more satisfying than the usual 'empty' chocolate bar. You can find these guys online at www.rhythm108.co.uk ,in health food stores around the country (including Planet Organic and As Nature Intended) in addition to fitness studios such as Good Vibes and Heartcore. Two of my favourites, it just so happens! Not ANOTHER protein ball right? Yes, I get it, as the market has become just a little saturated with the gooey balls of goodness, it takes one pretty damn special to get a look in. 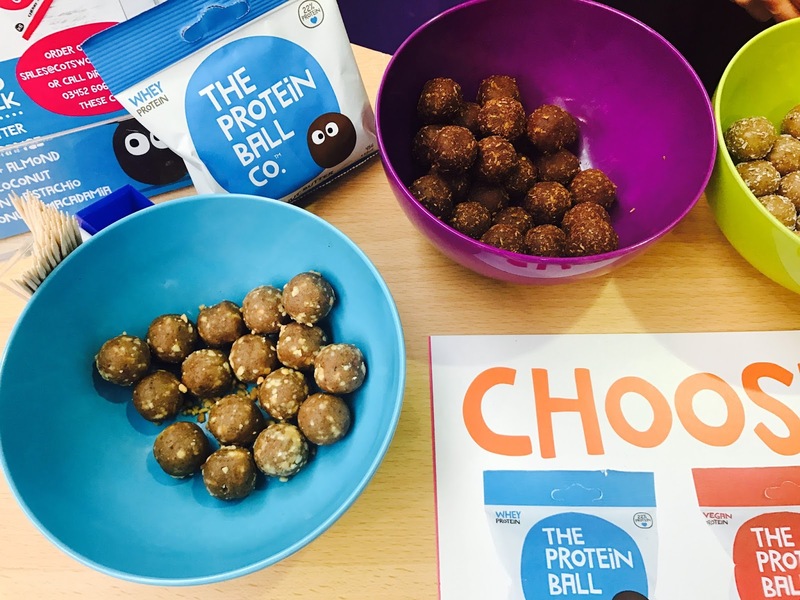 Which is where The Protein Ball Co come in! Founded by husband and wife Matt and Hayley Hunt after they struggled to find clean, healthy, on-the-go protein snacks, they came up with these all natural protein infused treats in six unique flavours. 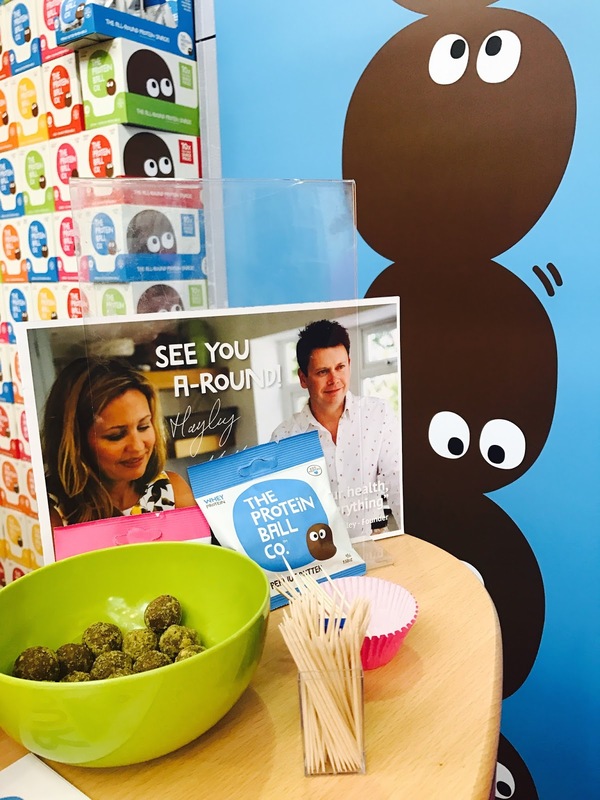 Sugar and gluten free, every ball is made the same way you would at home - pure, wholefood ingredients, hand rolled to perfection. 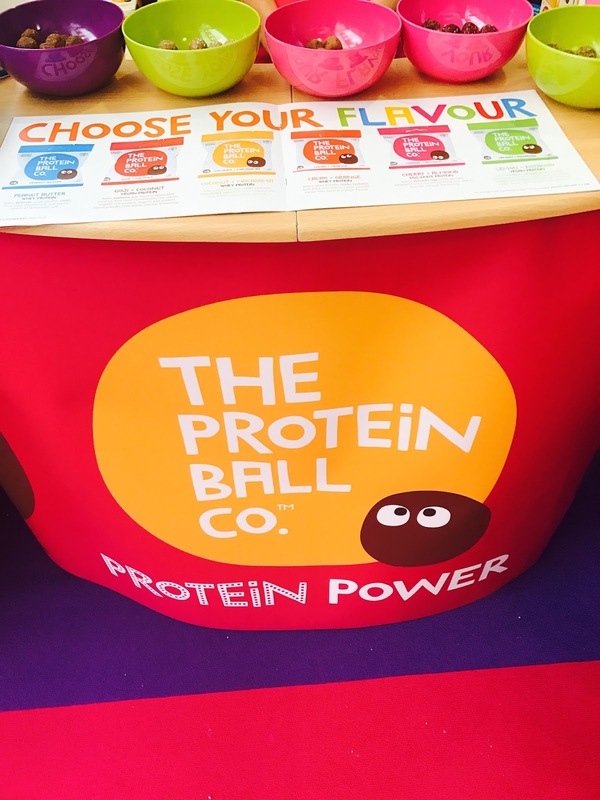 Now being sold in 12 different countries across the globe, the UK crowd can buy online at http://theproteinballco.com or from a range of stockists including Holland and Barrett, Revital Health, Sourced Market and everyone's favourite salad bar Tossed. OK, so when it comes to fresh fruit juices, I'm usually a bit skeptical. Yes, they might be healthy, but often that will be disguising a calorie laden trap that you don't think about when it's a 'juice'. Naturshot - however - is different. Created by a party loving city worker, health conscious founder of Natur Shot was bored of sugar laden smoothies yet, like most of us with full time jobs and an active social life, just didn't have the time to spend her mornings juicing fruit and veg and adding random powders of 'goodness'. Recognising there must be an easier way to get her 'fix', she created Natur Shot, a pure juice blend made with a combination of highly nutritious fruits, vegetables and superfood ingredients. With less than 17 calories per bottle, bursting with superfood ingredients including Matcha, Green Tea and Coffee Bean Extract, whether you're looking for something energizing, detoxifying, metabolism or immune system boosting, there's an option for anyone. Initially being drawn to the Coffee Bean flavor, I sampled this one first and loved the slightly sweet kick of the unusual cherry combination. 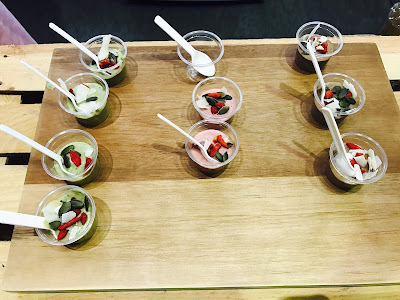 However, my favourite had to be the matcha! Depsite not being a huge matcha fan, the crisp blend of matcha, kale and cucumber was perfectly refreshing and cleansing! 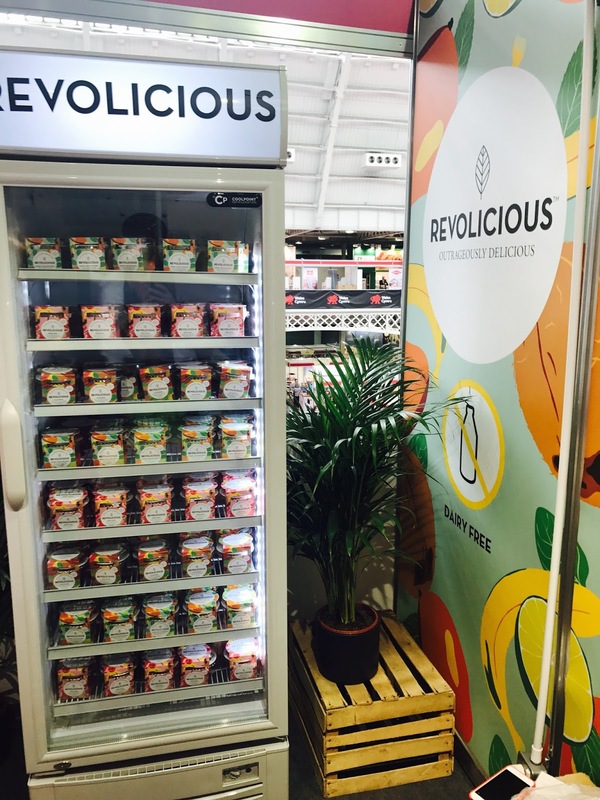 As the brand was literally just launching at the exhibition, they're currently only available online at http://naturshot.co.uk/shop/, but keep a lookout for them coming to health food stores very soon! 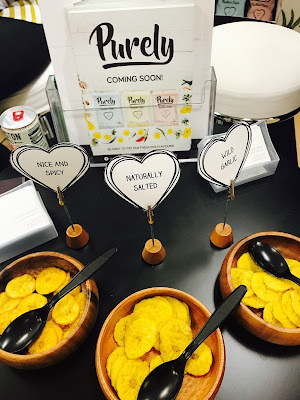 Plantain chips (i.e. banana crisps), are another one that can quite often be deceptively unhealthy. Yes, you may be choosing fruit instead of regular potato crisps, but the deep frying and high fat content still exists - often even in higher quantities, with a load of other additives and coatings, in order to provide the same crunch of a potato chip. Purely Chips, however, are just that - pure! 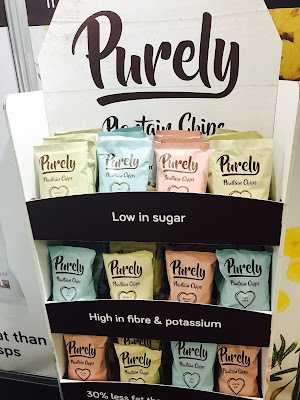 Zero additives or preservatives, ethically and sustainably sourced, minimally processed and offering many health benefits including fibre (around 2-3 times that of regular potato crisps), vitamins and minerals. Plus, as the chips are kettle cooked in minimal amount of oil, they contain only 8g of fat and under 150 calories per 28g serving. Thick cut, smooth textured and full of flavor, they come in three different varieties - Naturally Salted, Wild Garlic and, my favourite, Nice and Spicy. Currently not available to purchase, follow them on social media @welovepurely for updates of their launch into the market very soon! Created by former athlete, now nutritionist and physical education specialist, these are smoothie pots.... for on the go! A healthy alternative to most of the processed on the go breakfast options out there, these are plant based, free from gluten, dairy, added sugar and the rest of the nasties. Plus they taste insane! OK, it's number 6, but I couldn't complete the post without paying a nod to these guys - the Pie Minister Crew! Admittedly, even though they do feature gluten free options, they don't necessarily come under the 'healthy' category, but when they taste THIS good they're worth every calorie! Having said that, they company did at one stage range three pies under a 'lighter' category- 'chickalito', 'light as feta' and 'kooky chook' all had the same great taste as their traditional pies, yet with less than 440 calories each. Come on Pieminister, we want low calorie pies back in our lives!! !